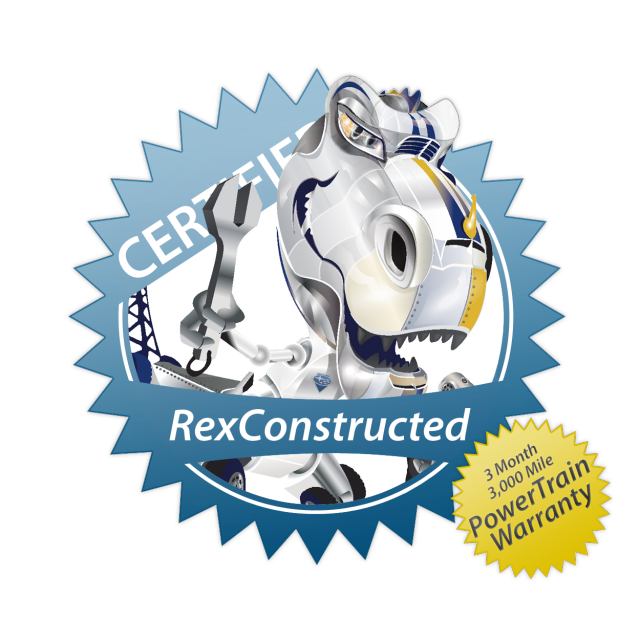 Rex is proud to offer a standard 3 Month / 3,000 Mile Limited PowerTrain Warranty on all of his vehicles. Read all about our used car warranty below, or check out a printable version here. All internally lubricated parts including: pistons, piston rings, piston pins, crankshaft and main bearings, connecting rods and bearings, camshaft and bearings, timing chain or belt, timing gears, intake and exhaust valves, valve springs, valve guides, oil pump, push rods, rocker arms, rocker arm shafts, hydraulic and solid lifters. The engine block and heads are also covered if damage is caused by a failure of any of the above covered components. All internal parts; torque converter; vacuum modulator and mounts. Does not include clutch assembly, pressure plate, flywheel, throw out bearing, worn synchronizers, cables or electrical items. The case is also covered if damage is caused by a failure of any of the above covered items. All lubricated internal parts contained within the housings. Axle shafts, differential housing, transaxle housing & final drive housing. Impeller shaft, bearings, bushings, and housing. Internal parts, vanes, shafts, bearings, and housing if damage is caused by a failure of a covered component. Internal parts including: bearings, bushings, sprockets, chains, sleeves and gears (excluding electrical items). The transfer case is also covered if damage is caused by a failure of any of the above covered components. Seals and gaskets are replaced only as part of repair or replacement of the above covered components. Leaking gaskets or seals are not covered. All the above items are not covered for damage due to accident, misuse, alteration, insufficient or improper maintenance, contaminated or poor quality fuel. In the event the warranty is applicable, THE DEALER IS NOT RESPONSIBLE FOR ANY INCIDENTAL OR CONSEQUENTIAL DAMAGES CAUSED BY OR RESULTING FROM THE DEFECT, MALFUNCTION OR FAILURE. DEALER IS NOT RESPONSIBLE TO PROVIDE ALTERNATE TRANSPORTATION PRIOR TO OR DURING APPLICABLE WARRANTY REPAIRS BEING PERFORMED. Upon inspection of the vehicle, if it is determined that the warranty is applicable, the dealer with repair the vehicle or have the vehicle repaired at an authorized repair facility. At the dealer’s discretion, repairs may be performed utilizing new, remanufactured, or recycled components. In the event of a defect, malfunction, or failure that occurs during the warranty period, the consumer must contact the selling dealer before any repairs are performed. All repairs must be authorized by the dealer; dealer is not responsible for any repairs performed without dealer’s authorization. Any repairs performed without dealer’s authorization will void the warranty. The dealer will arrange to have the car inspected by an authorized repair facility to determine applicability of the warranty. If the warranty is applicable the consumer must give the dealer a reasonable amount of time to perform the necessary repairs or to have the necessary repairs performed by an authorized facility. If the warranty is not applicable then the consumer may choose to have the vehicle repaired by the dealer or repair facility at an agreed-upon cost or remove the vehicle from the dealership or repair facility within a reasonable amount of time. This warranty is limited to the original purchaser of the vehicle only and is not transferable to subsequent purchasers. IN NO EVENT SHALL THE DEALER BE LIABLE FOR ANY INCIDENTAL OR CONSEQUENTIAL DAMAGES INCLUDING, BUT NOT LIMITED TO, LOSS RELATED TO PROPERTY OTHER THAN THE VEHICLE, LOSS OF USE, LOSS OF TIME, INCONVENIENCE, OR ANY OTHER ECONOMIC LOSS.